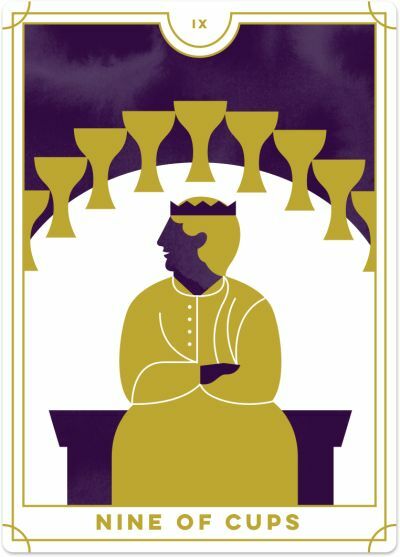 In the Nine of Cups, a man sits on a wooden bench. He is comfortable, but not too comfortable (you wouldn’t want to sit on that wooden bench all day!). His arms are crossed, and he has a smile on his face, expressing contentment and satisfaction. Behind him is a curved structure draped in blue material, with nine golden cups arranged in an arch. The cups represent emotional fulfilment after you carry out your deepest desires. You know those moments when you glance around and feel your heart overflowing with love and appreciation for everything you have created in your life? That’s what the Nine of Cups is about: emotional fulfilment, happiness and contentment. When this card appears in a Tarot reading, you are content in all aspects of your life – relationships, work, lifestyle, well-being and more. You are basking in the abundance of life and experiencing your emotions with such intensity and pleasure. This is why the Nine of Cups is often called the wish card. It comes as a sign that the planets aligned and you have everything you wished for. You could not be happier! If you made your wish and are patiently waiting for it to come to fruition, then this card is an excellent omen that it will soon be granted. The Nine of Cups is an invitation to splurge, indulge and enjoy life’s pleasures. This includes enjoying good food and wine, appreciating the arts, making love, relaxing in a luxurious resort or experiencing beauty. Live in the moment and give yourself permission to indulge temporarily without any guilt about the possible negative consequences of such pleasure. When you see the Nine of Cups in a reading, remember to count your blessings and express gratitude for what you have. Start or end every day by creating a mental list of the three things for which you are most grateful. Over time, you will intensify your sense of contentment and your ability to attract what you wish for – it is the Law of Attraction. If you are struggling to find the positive side of life, then expressing gratitude will help you see that you have a lot to be glad about. One thing to keep in mind with the Nine of Cups is that he is sitting on a wooden bench that is comfortable for only a limited period. Realise that contentment and fulfilment, too, are only temporary as everything is always in a state of change. That’s why it is so important to appreciate what you have now and cherish it because it may disappear later or you may need to adjust and adapt. Even when it appears that you have everything you ever dreamed of, it can still feel like something is missing deep down. Have you pursued material gain at the expense of your spiritual growth or emotional fulfilment? For example, you might own the most expensive home or car on the block, but you never see your friends and family and are pretty miserable. 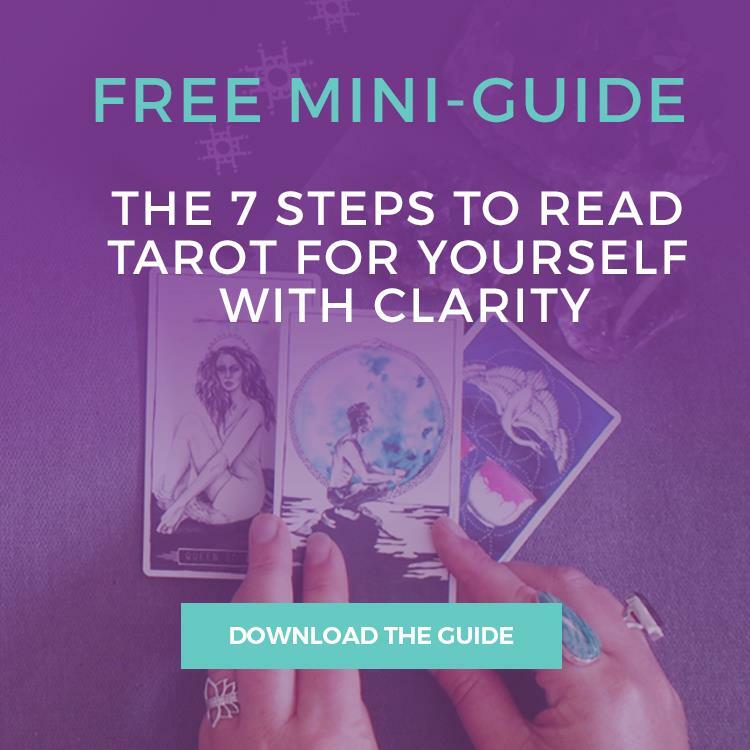 This is the essence of the reversed Nine of Cups, and when it emerges in a Tarot reading, it asks you to reconsider what you’re wishing for and align it with your Highest Good. You may have lost touch with what’s important to you, instead favouring the ego and chasing what will impress others. The reversed Nine of Cups is a sign that instead of looking outside yourself for your happiness, you should search within. Success and happiness mean different things to different people. So, instead of doing what you think will make other people happy, do what will make you happy. Ask yourself, 'What does success look like to me? And how will I know when I am successful?' If your outside world is not bringing contentment, change your definition of success. Sometimes, the reversed Nine of Cups suggests that you are frustrated that your wishes have not yet come true. Your expectations may be unrealistic, or you may not be actively pursuing your dreams, hoping that they will manifest with little input or action from you. You may have chosen goals that are not satisfying to you, and if so, it’s best to let them fall by the wayside. Now is the time to reconnect with your goals and dreams and recommit to bringing them to fruition. You may need to tweak your goals to keep them in full alignment with your personal values. And you may need to be more proactive in creating an action plan to see your goals come to fruition. The Nine of Cups reversed serves as a reminder not to over-indulge at the expense of your health and well-being. You may be prone to overdoing it on food, alcohol, drugs, partying or spending. Keep everything in moderation and focus on the long-term consequences of your actions, even if they bring short-term pleasure.